Andraz Struna rejected Hearts’ offer of a new contract to pursue offers from other clubs in Britain. The Slovenian internationalist spoke to the Evening News today to reveal details behind his departure, insisting it was his choice to leave Tynecastle. He wants to stay in British football and has several clubs in England and abroad chasing his signature. Hearts confirmed his exit last week along with five other January signings whose short-term agreements had expired. The 28-year-old right-back held “positive” talks with club officials during March and April about extending his deal. At one point, those looked like they could reach a successful conclusion as Hearts sought to retain a player with 25 caps for Slovenia. However, Struna ultimately refused their offer to seek pastures new. He bears no grudge having left Edinburgh amicably. “We had some positive talks with the club and with the manager. In the end, we didn’t reach an agreement. I didn’t accept the proposal. It was my personal choice,” explained Struna. “Everything was very positive from both sides about each other, but it was my choice not to accept and to move on. “From the talks, we understood the situation. I knew I had interest from other clubs and in this position I chose to make this decision. Pressed to reveal the location of these clubs and whether he could stay in Scotland, Struna remained coy. England holds obvious appeal for any player given the financial rewards on offer, especially one who is an established Slovenian internationalist. “I will say the interest is from clubs in Britain,” is all Struna would say. “I like it here so I will give an advantage to clubs from Britain. I will not stay in Edinburgh but I like Britain. I like the life here on the island. “I like the football culture and because of this I would like to stay here. If I have a good opportunity and a good offer, I will stay in this environment. I don’t know yet where I will continue my career. One aspect of British football culture he learned quickly at Hearts was playing amidst intense public scrutiny. The second half of the season was littered with disappointment for everyone concerned due to only six wins from December onwards. Supporters vented their dismay at players and coaching staff during matches and Struna didn’t miss the discontent. He is confident better fortunes are on the horizon due to the drive and ambition of the Tynecastle hierarchy. “The second part of the season was not really good,” he conceded. “The situation was not perfect and for some things you need more time. What I can say is Hearts is a big club who, for sure, have a bright new future. “The people leading the club are highly motivated. Things cannot happen overnight, like from today to tomorrow. “What is very positive is that the people running the club – the management, coaching staff, owner – these people are very motivated and very ambitious. What struck Struna most whenever he walked the streets of Edinburgh was the glaring passion and devotion of the Hearts fans. His career before hand denotes time playing in his native league, plus Poland and Greece, where fanatical supporters are virtually on every corner. 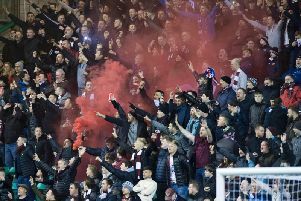 Hearts fans were on a different level, according to the player. “I met Hearts supporters a few times. What can I say?” he exclaimed. “I could see all the time that they love the club. When they stopped me, you could see in their eyes how much they love the club. They have such passion and it’s really amazing what this club means to the people. Should he succeed in his quest to stay involved in British football, the spell in Gorgie will have prepared him well for anything else he might encounter. Another priority for Struna is to one day return to Edinburgh and take in a Hearts match alongside the fans who struck such a chord with him. “If I have the opportunity and I have some free time, I will come back to Edinburgh to see some Hearts games. I would like to visit this city again so I hope I have the time to do this,” he said.